The Venus flytrap is a species of carnivorous plants known by the scientific name Dionaea muscipula. It is extremely well known for its ability to attract, capture, and digest insects. God has given the Venus flytrap the ability to adapt to its environment’s poor soil and lack of important nutrients like nitrogen. He gave it the ability to capture its own food to replace the nutrients that it can't gather from its soil. The fact that it can capture its own food makes it a popular subject in school to interest children, and intrigues many home gardeners. The Venus Flytrap, an Improbable Wonder that Baffled Darwin Venus flytrap challenges the ability of blind, unguided natural processes to design optimized, efficient, coordinated, elegant systems as seen in the carnivorous plant. Evolution News & Views, October 14, 2013. The anatomy of the Venus flytrap is extremely complex because of its strange trapping leaves. It consists of about four to eight traps that will catch insects. Each of these traps will be about an inch big which may not seem very big but suits the plants purpose (catching insects), quite well. The whole plant may become as big as about 5 inches. The inside of there leaves has an attractive sap with a sweet scent also some of the traps leaves may be red inside these qualities are what attract insects to the Venus flytrap. There is more than one way to reproduce a Venus flytrap. It will reproduce on its own through pollination, you can do a leaf pulling, you also can use a flower stalk, use tissue cultures, or you can allow it to grow and then separate the root. The first step in pollination will occur when pollen from one of the Venus flytrap’s anthers lands on the flower’s stamen. The anther can be on the same flower as the stamen this is called self-pollination or it can come from a different flower. 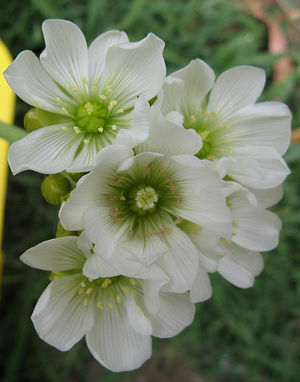 When it comes from the same flower the resulting plant will look exactly like the adult. The stamen of a Venus flytrap is in the center of the flower on top of the pistil which is larger then the anthers which surround it. The stamen will only receive the pollen when it looks fuzzy, this shows you whether it is receptive or not. The Venus flytrap can also be pollinated by another flower, some growers believe this results in better seeds. If the plant was fertilized in a few days the flower and its stalk will die and you will be left with a small pod with 20 to 30 black seeds inside. However if the plant did not fertilize the flower, it and its stalk will die in a couple of days but you will not have a pod of seeds. If you are growing the plant at home you would want to plant the seeds right away because they tend to become less likely to sprout the longer you wait. The plant will take between 15 days to a couple of months(at the most), to germinate. The Venus flytrap takes a long time to grow up, three to five years relatively. Another way you can reproduce a Venus flytrap is through a leaf pulling. To do a leaf pulling you have to dig up the whole plant, root and all, of the plant. Then you find a leaf that is not as attached to the root as the other leaves. Then with a downward pull you remove the leaf from the rest of the root. You can then transplant this separate leaf into normal Venus flytrap soil. It will take awhile for the plant to grow but it is faster then if you grow it from seed. You can also do the same thing with the flower stalk, just cut the stem as close to the base of the plant then stick it upright in soil and it will sprout. Habitat map for the Venus flytrap. Image of a venus flytrap leaf, showing trigger hairs. The Venus flytrap is well known for its ability to eat insects. It has hinged leaves that contain trigger hairs that when touched or moved will cause the trap to shut. It has about six of these trigger hairs which help it to capture its prey. The reason that the Venus flytrap has to eat bugs is because the soil where it lives is extremely poor in nutrients, making it difficult to get enough of the nutrients it needs to grow. So the plant is forced to find some other way to gain nutrients. The Venus flytraps leaves therefore are adapted to catching flies and other small animals. First the insect is attracted to the leaf either by the red color (inside some Venus flytraps), or the perfume it secretes. 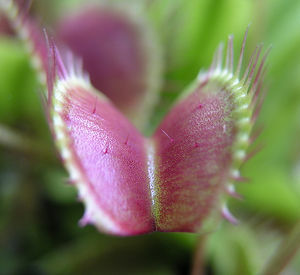 Then the insect moves around inside of the Venus flytrap triggering the sensitive hairs inside of the trap, the fly only needs to move two of the Venus flytraps six trigger hairs or one repeatedly. After the hair is triggered the trap shuts partially so that any small bugs may still get out, but not enough as to let the larger prey out of the trap. The spiny edging (cilia) to the trap's leaf helps to keep the large prey in like flies, slugs, spiders, caterpillars, ants, or crickets. If the large insect continues to move around trying to free itself it will trigger the trap to close all of the way forming a water-tight-seal. Then the plant releases digestive juices into the formed pouch they digest the insect and after about five to twelve days the trap opens inside you are left with the remains of the insect which is mostly just its husk. This will be blown away by the wind eventually. 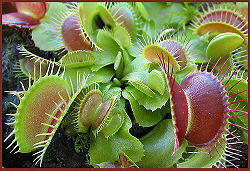 When a trap is sprung a part of the insect may be outside of the actual trap which can cause infection, this is why the Venus flytrap secretes antiseptic along with digestive juices to keep the plant healthy. However, if there is any parts of the insect outside of the trap the plant is way more likely to become unhealthy and die. If a trap does become infected it will die and turn black, after that it is best to cut of the leaf if you are growing it at home to help the plant stay healthier. A Venus flytrap does not always trap food after the trap has closed for a certain amount of times it will not close again. Instead it will stay open and just go through the process of photosynthesis instead of trying to capture insects. 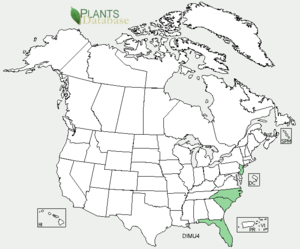 Venus flytrap taxonomy by U.S. Department of Agriculture. The Carnivorous Plant FAQ by The International Carnivorous Plant Society. Growing Venus Fly Traps by Wayne Schmidt. Propagation of Venus Fly Traps by Matt in association with Fly Trap Care. Venus Flytraps Caught In Shrinking Natural Habitat by cbs 11 tv. FAQ: Venus Flytrap by Booman Floral. How Venus Flytraps Work by Ann Meeker-O'Connell of How Stuff Works. This page was last modified on 29 October 2015, at 19:05.